Bei der Textanalyse (Textmining) ist die Sentiment-Analyse eine typische Tätigkeit. Natürlich steht und fällt die Qualität der Sentiment-Analyse mit der Qualität des verwendeten Wörterbuchs (was nicht heißt, dass man nicht auch auf andere Klippen schellen kann). Der Zweck dieses Posts ist es, eine Sentiment-Lexikon in deutscher Sprache einzulesen. Dazu wird das Sentiment-Lexikon dieser Quelle verwendet (CC-BY-NC-SA 3.0). In diesem Paper finden sich Hintergründe. Von dort lassen sich die Daten herunter laden. Im folgenden gehe ich davon aus, dass die Daten herunter geladen sind und sich im Working Directory befinden. Dann parsen wir aus der ersten Spalte (Wort_POS) zum einen den entsprechenden Begriff (z.B. 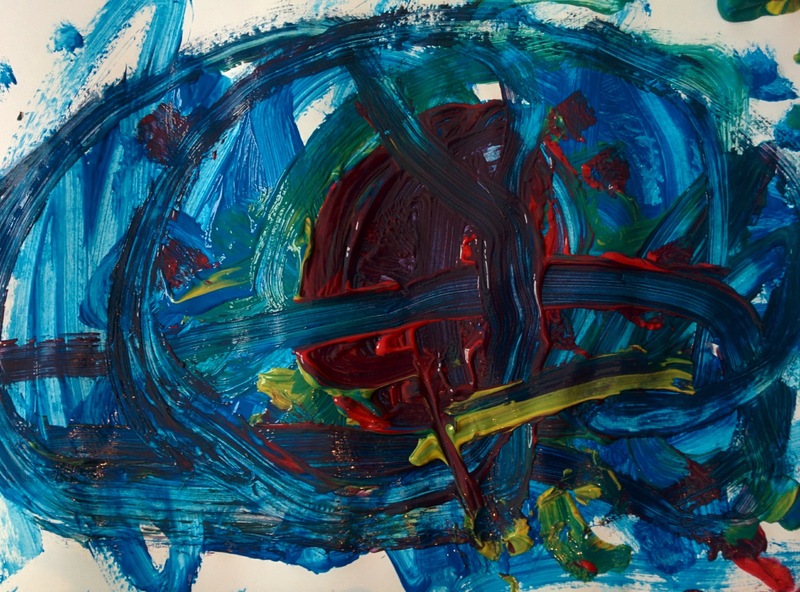 “Abbau”) und zum anderen die Wortarten-Tags (eine Erläuterung zu den Wortarten-Tags findet sich hier). str_sub parst zuerst das Wort. Dazu nehmen wir den Wort-Vektor Wort_POS, und für jedes Element wird der Text von Position 1 bis vor dem Zeichen | geparst; da der Querstrich ein Steuerzeichen in Regex muss er escaped werden. Für POS passiert das gleiche von Position |+1 bis zum Ende des Text-Elements. 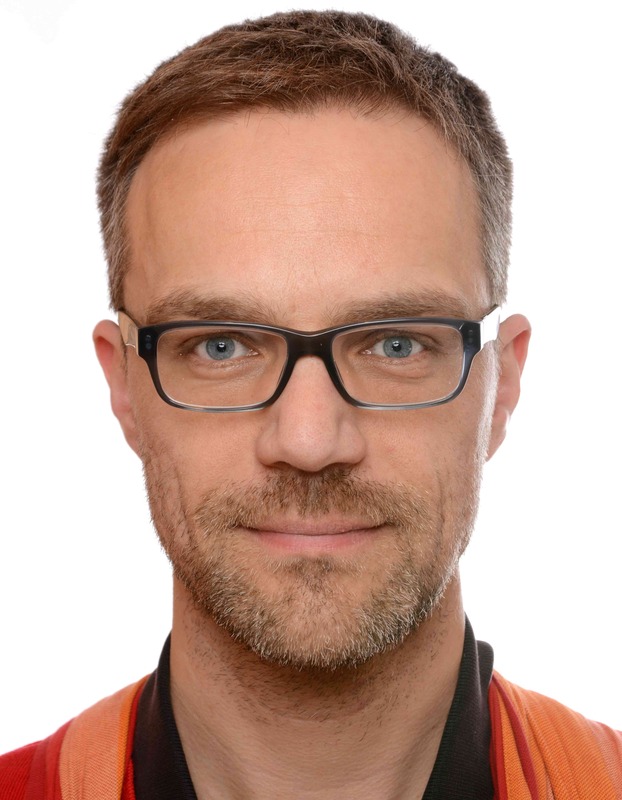 Das gleiche wiederholen wir für positiv konnotierte Wörter. 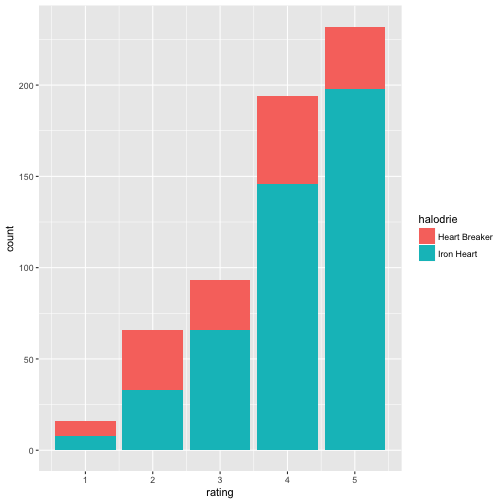 This posts shows data cleaning and preparation for a data set on a statistics test (NHST inference). Data is published under a CC-licence, see here. Data was collected 2015 to 2017 in statistics courses at the FOM university in different places in Germany. Several colleagues helped to collect the data. Thanks a lot! Now let’s enjoy the outcome (and make it freely available to all). Raw N is 743. The test consists of 40 items which are framed as propositions; students are asked to respond with either “true” or “false” to each item. In addition, self-rating of proportion correct, study time and interest in the subject are asked. Last column notes the number (proportion) of correct responses. Alternatively, use this link: https://osf.io/zcvkd. To make the data set less clumsy, let’s replace variable names. The vector test_inf_names can now serve as a codebook; the variable names are stored there. We can now compare the actual answers to the correct ones for each respondent. Let’s leave that for later :-) What’s more, the items (questions) have changed over time. Malheuresement, the software used for delivering the survey (Google forms) does not save the history (and I did not really either, I admit). So I am not 100% sure whether the “solution vector” above is correct for each and every (older) respondent. Instead, in the first step, let’s focus on the data where the solution is already provided for brevity. This information is stored in V_46 (Punkte). Let’s convert that string to a number. 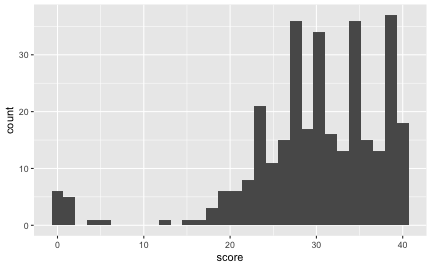 Out of curiosity, let’s look at the distribution of the score. #> Warning: Removed 443 rows containing non-finite values (stat_bin). Note that the NAs are not shown. If a given student didn’t know anything, but would flip a coin for each answer, what’s the probability of getting x correct answers? In other words, in a sequence of 40 coin flips, what’s the probability of getting at least x right? The diagram shows the probability of getting not more than x right. From a crude glance, say, 15 to 25 corrects answers are quite compatible with chance (coin tossing). Let’s extract these and see how many cases are left. 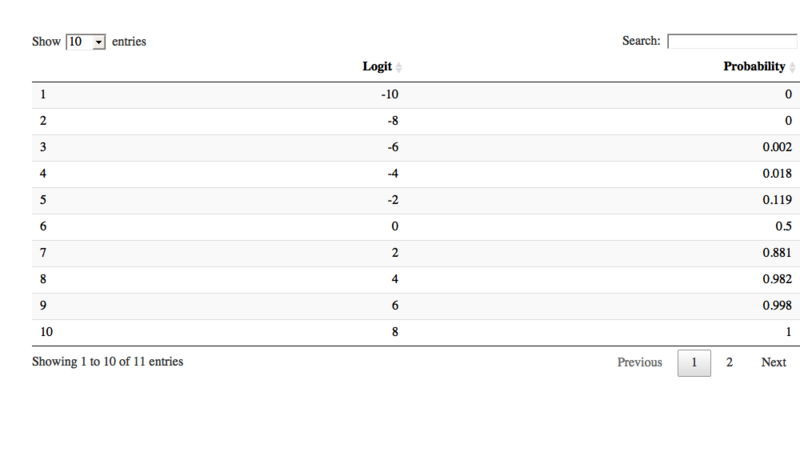 As the initial score variable was Punkte, let’s see how many NAs we had there. OK, let’s assume all responses > 15 are “real” trials, not just guessing and clicking. 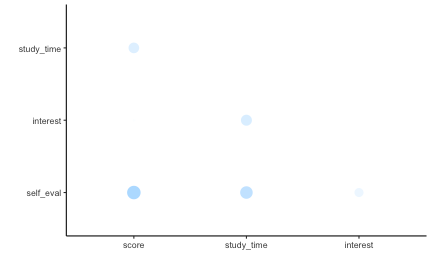 Now, what’s bothering me since years is whether (and how strong) there is an association between score and study time. Now finally, let’s jete a coup d’oeil. #> Warning: Removed 68 rows containing non-finite values (stat_smooth). #> Warning: Removed 68 rows containing missing values (geom_point). And the correlation is 0.441; hey, that’s quite strong! Given some measurement error, it can be speculated that the real, unattenuated correlation is quite substantial indeed. Similarly, if one is interested in the subject, does she scores higher? Well, if I think I will score poorly (superb), will I do so? Does my self-image match the actual outcome? Oh, that’s strong; folks know when they’ll nail it. Good. Finally, let’s look at the correlation matrix of the variables mentioned above. A scatter plot matrix can be of interest, too. #> Warning: Removed 68 rows containing non-finite values (stat_density). As a teacher, I feel reassured that study time is associated with test performance. Processed data can also be downloaded, here. 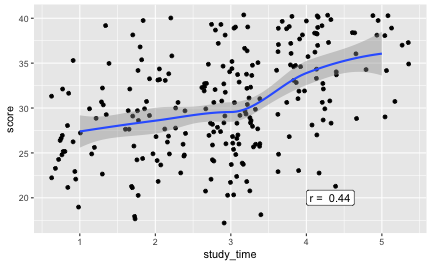 Logistic regression may give a headache initially. 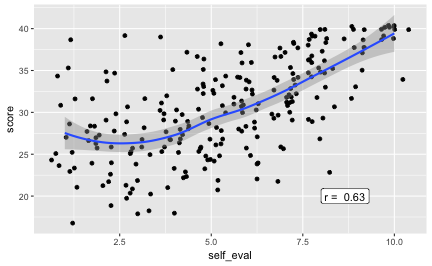 While the structure and idea is the same as “normal” regression, the interpretation of the b’s (ie., the regression coefficients) can be more challenging. 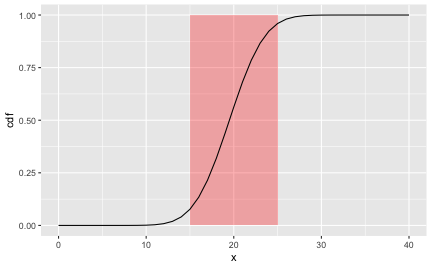 This post provides a convenience function for converting the output of the glm function to a probability. Or more generally, to convert logits (that’s what spit out by glm) to a probabilty. Note2: I have corrected an error pointed out by Jana’s comment, below (you can always check older versions on the Github repo). These coefficients are in a form called ‘logits’. If coefficient (logit) is positive, the effect of this predictor (on survival rate) is positive and vice versa. Here Pclass coefficient is negative indicating that the higher Pclass the lower is the probability of survival. This function converts logits to probability. The survival probability is 0.8095038 if Pclass were zero (intercept). However, you cannot just add the probability of, say Pclass == 1 to survival probability of PClass == 0 to get the survival chance of 1st class passengers. where b_survival is given in logits (it’s just the b-coefficient of Pclass). Remember that . That is, if your logit is 1, your odds will be approx. 2.7 to 1, so the the probability is 2.7 / 3.7, or about 3/4, 75%. Similarly important, . Hence, your odds will be 1:1, ie., 50%. Hence, whenever your logit is negative, the associated probability is below 50% and v.v. (positive logit <–> probability above 50%). In the 1st class, survival chance is ~65%, and for 2nd class about 44%. A handy function is datatable, does not work in this environment however it appears. 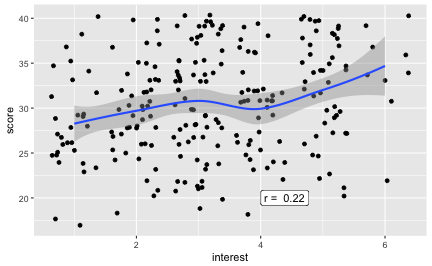 The package mfx provides a convenient functions to get odds out of a logistic regression (Thanks for Henry Cann’s comment for pointing that out!). More convenient for an overview is a plot like this. The relationship between logit and probability is not linear, but of s-curve type. The coefficients in logit form can be be treated as in normal regression in terms of computing the y-value. Transform the logit of your y-value to probability to get a sense of the probability of the modeled event. Bar plots, whereas not appropriate for means, are helpful for conveying impressions of frequencies, particularly relative frequencies, ie., proportions. Intuition: Bar plots and histograms alike can be thought of as piles of Lego pieces, put onto each each other, where each Lego piece represents (is) one observation. Presenting tables of frequencies are often not insightful to the eye. 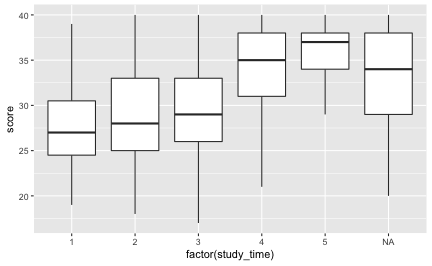 Bar plots are often much more accessible and present the story more clearly. 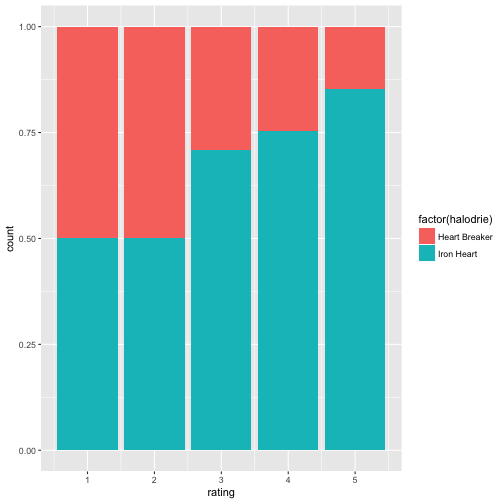 In R, using ggplot2, there are basically two ways of plotting bar plots (as far as I know). 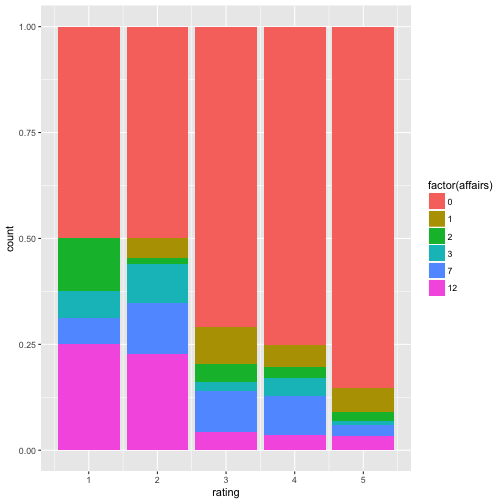 First, we can just take a data frame in its raw form and let ggplot2 count the rows so to compute frequencies and map that to the height of the bar. 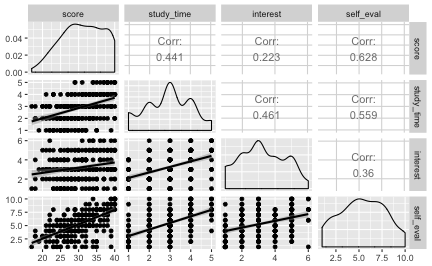 Second, we can do the computation of frequencies ourselves and just give the condensed numbers to ggplot2. Let’s look at each of the two ways in turn. 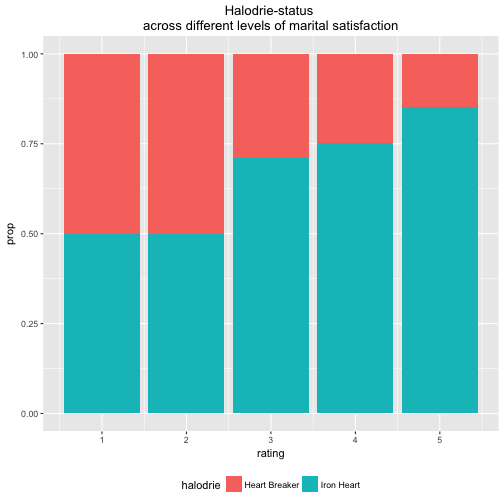 # Recode: 0 -> "Iron Heart"; else -> "Player"
Data comes from Fair (1978): Fair, R.C. (1978). A Theory of Extramarital Affairs. Journal of Political Economy, 86, 45–61. Some notes. We use fill = ... to say “put the number of ‘Heart Breakers’ and ‘Iron Hearts’ onto each other”. So the columns for ‘Heart breakers’ and for ‘Iron Hearts’ pile up on each other. Of importance, the position = "fill" (note the quotation marks) will make “proportion bars”, so the height of the bar goes up to 100%. This is obviously only of use if different colors indicate the relative height (frequencies) of the categories in the bar. Don’t forget to make the filling variable of type factor, otherwise the filling can go awry. Easy, right? Note that geom col (as in column) expects single numbers; it does not count rows (as does geom_bar). In effect, geom_col(...) is geom_bar(stat = identity, ...). 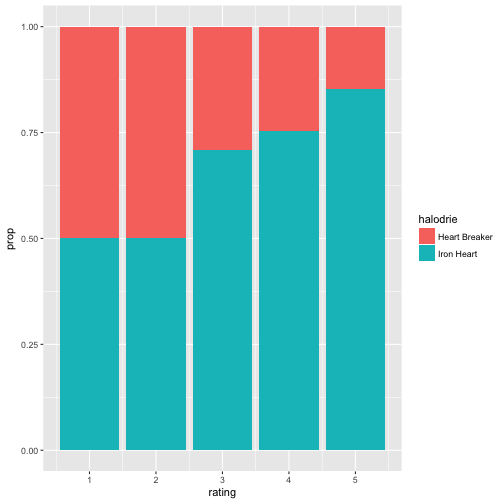 As our proportions sum up to 100% we do need need to care to tell about relative height plotting. Works out automatically. Now suppose, we want not showing the proportions, ie., the bars should not have height 100%, but the real count-height. position = "stack" will accomplish that. 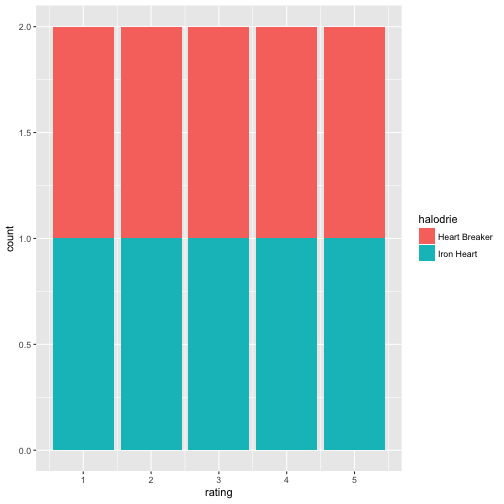 Note that this view makes it more difficult to tell in which column the proportion of “Heart Players” is high(er).